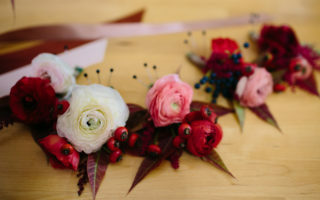 As you’re figuring out how to turn your Pinterest floral fantasies into reality, we’re here to help you figure out how (and when) to hire a floral designer, if DIYing your wedding flowers is right for you, and how to manage all those blooms (and dollars) without going crazy. Most wedding traditions are reasonably new (it was Queen Victoria that brought in white wedding dresses, after all). But flowers have been tied to weddings since more or less the dawn of time. Of course, for most of history, having flowers at your wedding meant… picking some flowers. And these days having flowers at your wedding means figuring out florists fees, or getting comfortable with thorn strippers and floral sheers. Hire a Florist? Or DIY? It’s easy to think that you have to hire a florist (or floral designer) to take care of all your wedding flowers, or go totally DIY. Fact check: you don’t. And using a professional for some of your florals while DIYing the rest can be a great middle ground. If you’re only looking to hire out some of your wedding flowers, you might need to do a little extra research when hiring a florist. A lot of higher end floral design studios have price minimums, and will only take on full weddings. However, with a little research, you can often find a florist that will take on a smaller number of projects (though delivery might not be included). Hire someone to create your bouquets (and any corsages and boutonnieres that you might want), and take care of centerpieces on your own. Chances are, the flowers you’ll care about most are the ones that you’re holding… and creating a truly stunning bouquet requires a lot of skill. So get a pro to make you the prettiest personal flowers ever, and handle the rest on your own. Hire out the bouquets, and make non floral centerpieces… which can be created well in advance of the wedding with minimal stress. See our full roundup of non-floral centerpiece tutorials for more ideas. Hire out the bouquets, skip the centerpieces. Question: how many wedding centerpieces can you remember? Answer: probably not many. While centerpieces are nice, they often take a lot of money and effort to create, and get minimal guest attention. If you have long tables, or smaller tables, you can often skip the centerpieces without people even noticing. The minute the table is piled with food, the centerpieces are lost in the shuffle. Can you DIY your wedding flowers? Absolutely 110% yes. In fact, nearly every APW editor DIYed their wedding flowers and lived to tell the tale. 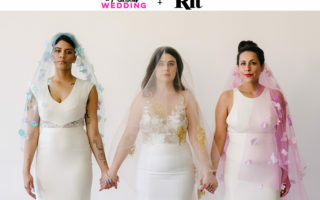 Do you want to DIY your wedding flowers? Maybe. But also maybe not. DIYing all of your wedding flowers is a huge undertaking, made trickier by the fact that unlike most craft supplies, flowers die. (And hence, wedding flowers need to be done the day before, or the morning of, your wedding.) That said, DIYing your wedding flowers can save you a pile of money, and that may just end up being worth it. If you take on this project, it’s important that you do a fair amount of research, pre-planning, and realistic expectations. APW’s Editor-In-Chief DIYed her own wedding flowers, and her overview is a great starting point. We have tons of tutorials on how to make a wedding bouquet. Start with this basic tutorial, and then branch out. Want to make a wedding bouquet with grocery store flowers? A wild looking bouquet? A huge oversized bouquet? A single flower bouquet? We’ve got you covered, with tips and tricks to make each of these projects actually as easy as they seem. Our floral archives are full of DIY wedding centerpiece ideas, but this carnation centerpiece (which checks the boxes of easy, hip, and cheap) is a great place to start, as is this affordable version of the formal floral urn.